2 What Type of Battery? 6 Questions? Suggestions? Corrections? Ideas? There are serious safety issues involved with wiring your own system. The voltages are high, and potentially lethal. Doing the system incorrectly can lead to serious consequences down the road. PV systems have the added hazard that even when the grid power is turned off, the system can be “live” and present a serious shock hazard. I want to make it very clear that I am not an electrician, and I take no responsibility whatever for the correctness of the material below — you need to do your own homework! For the most part, your choice for a house battery will be between two types of deep cycle lead acid batteries. One option is a conventional flooded lead acid (FLA) battery. These have been around for many years, and consist of lead plates in a liquid sulfuric acid electrolyte. The other common option is the absorbed glass mat (AGM) battery. This is also a lead acid battery, but instead of a liquid electrolyte, it uses a glass mat between the plates that is saturated with the electrolyte — there is no liquid electrolyte. The AGM batteries are sealed units. In both cases, you want to be sure to get deep cycle versions — regular car stating batteries will have a very short life if used as an RV house battery as they just are not designed for frequent deep discharge. Batteries designed for applications like golf carts or off-grid solar electric systems are what you want. 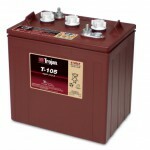 Trojan Battery offers the T105 golf cart deepcycle battery in an FLA version (T105) and in an AGM version (T105-AGM). This provides one way of comparing FLA and AGM technologies in the same size battery. The big market for these batteries is for golf carts, but many Camper vans (including mine) use two of them is series for their house battery. Data for the same size Deka AGM battery is also shown. So, the table just reinforces the pro/con list for AGMs vs FLAs: the AGMs require less maintenance, typically don’t require venting, have less concern about acid spills or leaks, are about the same size and weight for the same capacity FLAs, cost about twice as much, and have a somewhat shorter life. Pick the set of features you like the best and go with it — either AGM or FLA will do a good job. 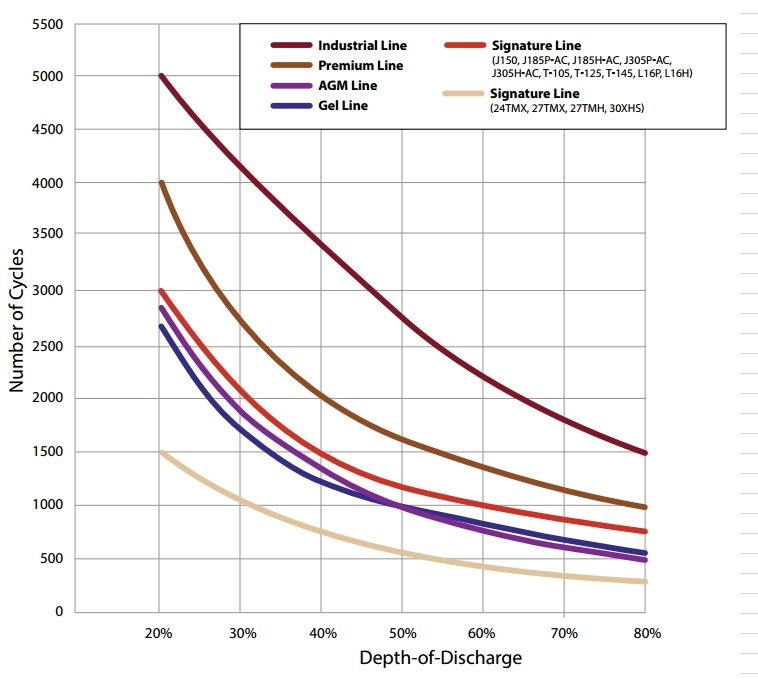 Cycle Life — the Trojan guide on batteries for Renewable Energy applications gives this comparison of cycle life for several of their battery families, including AGMs and FLAs. The plot shows how many charge-discharge cycles you can expect your battery to last vs how deeply you discharge them. The plot shows FLA batteries (the red line) having about a 20% longer cycle life that AGM batteries (the purple line). US Battery and Deka have similar charts that shows somewhat similar results. I have heard people express the opposite opinion (that AGM life is longer), but this is the only actual data I could find, and it indicates a little better cycle life for FLAs. Recommended Charge Rate — It is often said that AGM batteries have lower internal resistance, and can therefore be charged at much higher rates. But, this does not appear to line up with the battery maker’s recommendations. US Battery recommends charging at 10% of the C20 battery capacity rating for both AGMs and FLAs — this would be 22 amps on a 220 amp-hr rated battery. The Rolls-Surrettee, a maker of high quality FLA and AGM batteries, recommends charging 25% of the capacity of the batteries for their AGM batteries, which is a 2.5 times higher. If you want to charge at more than 10% of your batteries capacity, I’d contact the manufacturer of your battery and see what they recommend. Charging From Van Alternator — Assuming that your van has an FLA for its battery, and that your house battery is an AGM, and that you want to be able to charge both batteries using the van charging system, then the charging system will be trying to charge two different types of batteries. The question is whether the AGM battery will be OK with this and will still have good life. The charging voltages vary a little between the two batteries, but looking at the two versions of the T105 above, the differences are small. I’d like to hear from anyone who actually has been doing this for a good long time to report on how it has worked out. Some people have gone so far as to run a 120 VAC AGM battery charger from the camper vans inverter. This seems a bit cumbersome and maybe not to efficient, but it would be one way to insure that the AGM house batteries are getting charged properly. There is also at least one commercial DC to DC AGM battery charger — it takes power from the van battery and uses it to run an AGM charger to charge the house battery. My Choice — In the end, I went with the FLA choice (I’m a cheapskate), but either setup can work fine. One somewhat odd factor for me is the knowledge from working with people on solar projects that it is very easy to kill a set of batteries in any number of ways, and that many battery sets die well before their time from owner screw-ups or neglect. If I have to replace a set of batteries after having killed them early, I’d rather put out $200 for the replacements rather than $400+. If you mount the batteries inside the van, then they should be in a strong container that is bolted through the van floor in such a way as to keep the battery from becoming a missile in a crash. If the batteries are FLAs, then the battery container should be vented to the outside of the van. These pages show how I did the battery compartment for our conversion: Electrical… and Beds… There are many other approaches, including a wide selection of commercial battery containers — just make sure you have a good way to anchor them. In a 20g crash, a pair of golf cart batteries will exert nearly 3000 lbs on the battery case. There is a third choice in battery type coming along. A few people are trying Lithium batteries. They have a greater energy density, so the battery pack can be smaller and lighter. But, they are expensive. Here is one good description of a lithium battery replacing an AGM battery — Smart Battery Lithium Battery Project… and a Followup… The approach he used to replace an existing lead acid battery in his RV was to utilize a lithium battery that is intended to be a drop in replacement for a lead acid battery — one with a built in battery management system. He replaced a group 31, 100 amp-hr lead acide battery with a lithium drop in of the same size. The Smart Battery company provides various sizes of lithium batteries that are intended to be direct replacements for lead acid batteries. Their lithium batteries have a built in management system that sees to charging the lithium cells correctly and protects them against adverse voltages etc. A new charger may be required as the charging voltage for lithium batteries is a bit higher than lead acid, but some existing chargers are OK or can be adjusted. As a rough cost comparison — our two 6 volt Costco golf cart batteries provide a usable 175 amp-hrs when discharged to 20% and cost a total of $170, and weigh 130 lbs. The closest Smart battery would be the SB150 provides 150 amp-hrs when fully discharged, costs $1900, and weighs 65 lbs. There is a comment from Ralph below that you should take a look at if interested in Lithium batteries. I do think that as the price of lithium batteries drop, that they will become an attractive way to go — especially for people with heavy loads and/or full timers. US Battery — lots of reference data. EastPenn — maker of Deka AGM batteries. 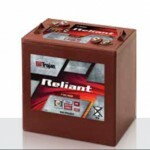 Trojan Battery T105, a 225 amp-hr, 6 v0lt, deep cycle FLA battery… Specs on capacity, charging, etc. Trojan Battery T105 AGM, this is the T105 in AGM form… One way to compare AGM and FLA in the same size battery. US Battery AGM 6V27, a 214 amp-hr, 6 volt, AGM deep cycle battery… Gives complete specs on this battery including capacity, recommended charge voltage and amperage, and expected life cycles vs DOD. There is a lot of data out there on batteries and charging systems on the internet. While some of this material is good and helpful a surprising percentage is just plain wrong. So, be careful — the references given above are good. For other sources, I’d treat everything with some skepticism and try to check multiple sources. Trojan battery offers a lot of good data on their site, and will answer email or phone questions and in my experience they know their batteries well. Thanks for all this helpfu, concise, and easy to understand /absorb info! A great read!!! Especially for a newbie like me. Maybe you can keep us posted on how the new batteries work out? I would suggest you add that the agm used as a coach battery with a fla in the vehicle could be charged properly when camping with an adjustable MPPT solar charger thus using the alternator to provide only the bulk charge and the solar as the float? The discussion of Lithium batteries really needs to get attention which you may have no interest in doing. I say this because folks ignorant of battery technology are purchasing extremely expensive Li due to no more than its sexiness. Since Li is getting a lot of play as tiny car jump starters it is natural for folks to think this is great for my camper when in fact they have no use for its high current capacity and don’t understand the need for charging voltages and its heat production dangers. You treat the overall subject well, clearly and correctly IMHO.